But most observers have commented that the 60 votes needed in the Senate to deliver an economy wide cap-and-trade approach are not there. As a result, various other energy only bills are being discussed, but with some that include cap-and-trade limited to utilities only. Whilst the preferred solution is the economy wide cap-and-trade approach, the question that really needs to be discussed is whether a more limited implementation can do the job? Today in the EU, where cap-and-trade has been running for five years now, the limited approach is a reality and will continue to be so for the rest of this decade. The EU Emissions Trading System (EU-ETS) covers all large point sources, i.e. those in power generation and major industry (refineries, cement plants, chemical plants etc. ), with the power sector making up nearly 70% of the system in terms of emissions. To date, all sectors have received the majority of allowances for free, but for the period 2013-2020 the power sector will need to purchase allowances through auctioning. For much of the industrial sector, some 75% of allowances will continue to be granted for free, with a distribution ranging between 50% and 90+% depending on performance against benchmarks. This is being done to offset competitiveness concerns. The reality is that through to 2020 the EU system is power generation dominated, with industry able to capitalize on the opportunity value offered by the CO2 price but with only modest direct financial exposure to the market. This approach is managing nearly 50% of the emissions across the economy, with the balance targeted by a number of efficiency standards and in the case of transport fuels, a renewable fuel obligation that requires a certain bio content of the fuel. 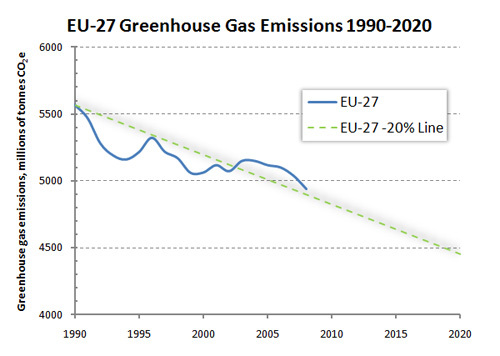 It is also working, with the EU on track to meet its 2020 target. Looking at the USA, significant opportunity exists to reduce emissions in the power generation sector. Natural gas supply is increasing thanks to new discoveries and the availability of shale gas and there is surplus natural gas generation capacity within the economy. With lower natural gas prices as a result, this has played a role in the downward trend in US emissions in 2009, although the continuation of this trend will be very dependent on the gas price relative to coal. The emergence of a carbon price in the utilities sector could do much to sustain this trend, allowing the full potential of natural gas as a lower emissions fuel to be realized within the US economy. 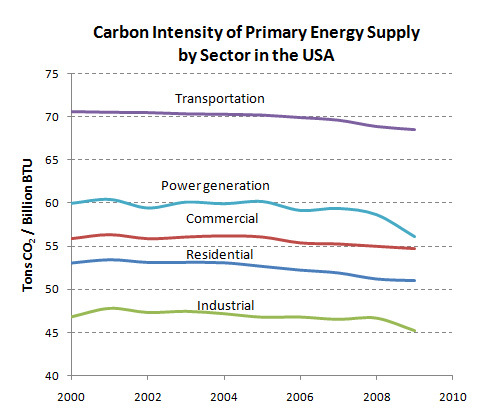 The fuel mix and associated carbon intensity of most sectors have tended to be very stable over time. However, in 2009, the carbon intensity of the electric power sector decreased by nearly 4.3 percent, primarily due to fuel switching as the price of coal rose 6.8 percent from 2008 to 2009 while the comparable price of natural gas fell 48 percent on a per Btu basis. The carbon content of natural gas is about 45 percent lower than the carbon content of coal and modern natural gas generation plants that can compete to supply base load electricity often use significantly less energy input to produce a kilowatt-hour of electricity than a typical coal-fired generation plant. For both of these reasons, increased use of natural gas in place of coal caused the sector’s carbon intensity to decrease. Even without direct involvement in a limited cap-and-trade system, industry could still reduce emissions through a domestic offset approach. The opportunity value of carbon in the utility sector would drive the reductions. This wouldn’t be so different to the situation in the EU between 2013 and 2020. Neither the transport or buildings sector are very responsive to a modest change in energy price (i.e. through the addition of a carbon price), which means that even in an economy wide cap-and-trade there would be limited impact seen in these areas through to 2020. Reductions would more likely be driven by the existing efficiency standards and fuel mandates that are already in place or are under consideration within an energy bill. In fact, if these mandates are too strong relative to a given 2020 goal [i.e. not properly calibrated to the goal], their effect in an economy wide cap-and-trade could be to undermine the reduction opportunities in the power sector. So despite some observer gloom that a limited climate bill might be the best that can be done today, such an approach could potentially deliver the same outcome anyway, at least through to 2020. Beyond that it will be important to have the economy wide approach.